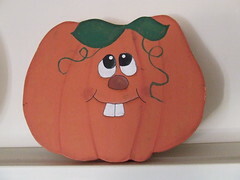 Mom and Carl are here and we’ve unloaded the truck, sorted through all the stuff (sent back what we don’t want…) taken Mom into town shopping, chopped all the veggies, made fabric pumpkins for the centerpiece, and… I dunno. I think they are playing on the Wii and watching Shrek 3. The pots are bubbling away on the stove, and I just glazed the ham. I’m at the spot where I have a ten to fifteen minute lull and then I can drain, mash, and present. The menu? Well, I know you are on the edge of your seat waiting. quarter and gut a buttercup squash, place in baking pan. bake for a half hour or so. add a small knob of butter and a couple spoons of brown sugar to hollowed out bits. Finish baking. when done, use a large spoon to scrape it all off into a bowl, squash included, leaving skins behind. Mom also brought potato stuffing (which I have to get the recipe for AGAIN and put it in my blog this time) and pumpkin pie for dessert. – any sized package of meat bits. Ribs, boneless ribs, riblets, stewing cubes, heck – even chicken pieces. I usually have a “club pack” package. Maybe 1,5 kgs? (3-5 pounds) although this works with smaller quantities. Toss the meat in the pan. That’s pretty much it because I am too lazy for pre-browning and all the fat will be rendered off later anyway. I don’t even defrost the meat. Pour all over the meat. I then add about a cup of water to the measuring cup and swirl it around to clean it out, then I dump that water in too. Chop up an onion if you like and add that. You can quarter it if you still want to see pieces of onion. If you chop up the onion, the pieces will pretty much disappear. Cover the dish. Foil works real well and you don’t need to wash it later. Toss it in the oven at 275-300 degrees for 3 hours. After a half-hour check on it again. Things should look pretty sticky. Add a bit of water if you want it saucy. If you don’t care, leave it. At the 4 hour mark, check again. Looks good? Dinner is served. 😀 I usually leave it till it gets a little crispy round the edges. 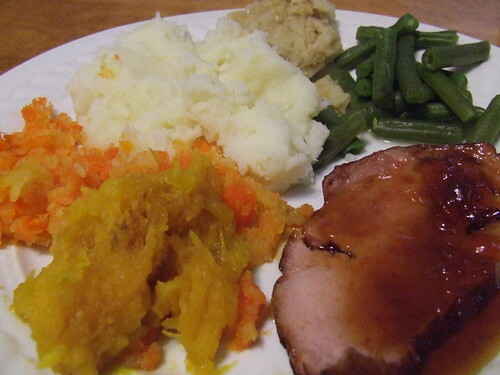 I serve this with boiled and mashed potatoes with nothing else added to them, as they will soak up the sauce. I normally don’t pay too much attention to the time, I just put it in the oven when we’re done with lunch and check on it before I do the potatoes for supper. You could probably toss this in the crock pot on high all day. I dunno, I have no luck with crock pots. Measure out all this and sift together. Stir in gumdrops. Stir this well into the dry mixture. Pour into 3 or 4 small greased loaf pans and bake at 350 for 50 minutes. Test with a toothpick for doneness. Best served cooled, with a little spreadable margarine on it maybe, a nice pot of hot strong tea to one side, and the company of one’s elders. Usually I get an idea for Recipe Friday and write it up ahead of time, setting it to post early on Friday. Not this week. This week I was stumped. And I also got really busy with some work and didn’t get this posted on Friday. 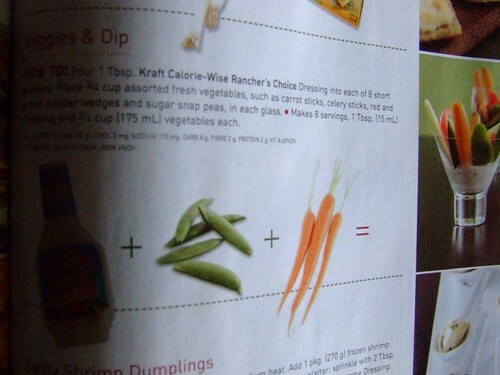 The Kraft Canada “What’s Cooking” magazine showed up on Thursday. Now, don’t get me wrong here, I like the mag, it has tons of great ideas, and I do understand it exists to sell products. But every so often it falls short. It passes from annoying me right into plain insulting and obnoxious. That’s right folks, it’s a recipe for veggies and dip. Take veggies. Add dip. You too can be a culinary genius! I am glad they told me that because I would have had no idea what to do with these fresh veggies and this bottle of veggie dip. I mean, I didn’t go to a chef college or anything, so I do not know these things. What? You mean I don’t have to consume your products one at a time? I can mix them up? Or combine them to make more interesting meals? Who would have thought? The mind, it is truly boggling. Think of all the mealtime opportunities I now have. Cookies and coffee: who knew? And Jello plus Cool Whip PLUS fruit? Someone notify Bill Cosby. He’s gonna LOVE it. And lastly, I bring you this gem from the previous magazine. 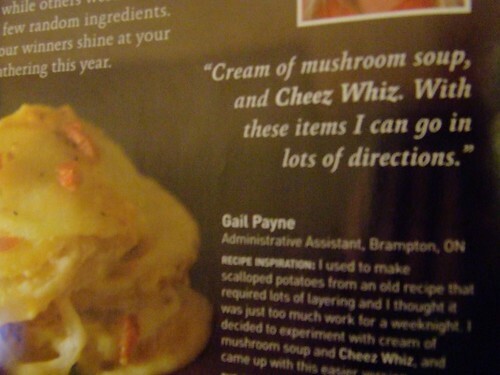 If you can’t read it, it says “Cream of mushroom soup and cheez whiz. With these items, I can go in lots of direction. !” No! No you can’t! If you mean a trip to the ER after a steady diet of it. And if you do think you can go lots directions with that, obviously you’ve already been consuming far too much of it and it’s affecting your brain. Put the can of soup down, please. Back away from the cheez whiz. The rest of the magazine was good, and I feel compelled to note in the interest of full disclosure that I do indeed have some pages marked for me to try later. I HATE THAT YOU MAKE ME LOVE YOU, KRAFT. EVEN WHEN YOU INSULT MY INTELLIGENCE. These are those deceptively plain yet curiously rich and addicting shortbread cookies you see at group functions everywhere. You know the ones. These are them. Don’t say I didn’t warn you. Cream butter. 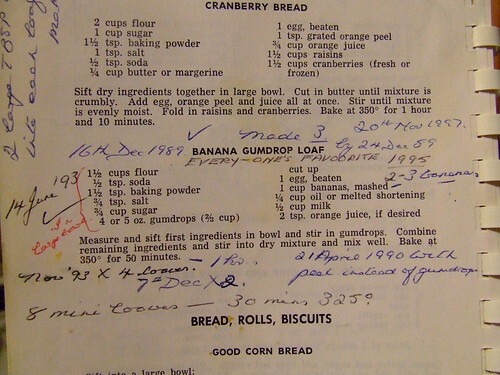 Add rest of ingredients and beat by hand. 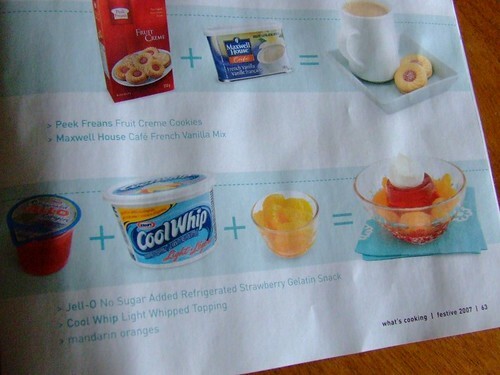 Actually, add the sugar and cream it really well, then add everything else. I’ve used a hand mixer with no issues for light and fluffy texture. Drop by teaspoonful, use a cookie press or roll in balls. Top with cherries or colored sugar. Bake at 325 for 15 minutes. You can do quite a bit with this dough. Enjoy! If you are lazy or in need of a quick fix, just drop spoonfuls on the pan and bake. If you want to be like grandma, roll it out and cut circles. Bake and then dot with a dab of icing and a small piece of cherry on top. Or roll a ball of dough in colored sugar then bake. Use different flavorings. Instead of vanilla, try almond, english toffee or even orange. Roll in logs, bake and dip one end in chocolate. This recipe halves well and freezes well. It occured to me earlier this week that I need to blog more recipes and I need to do it regular. So welcome to Week 1 of Recipe Friday. Feel free to join the bandwagon! Brown the ground beef, and boil them noodles. (Easy, so far, huh?). Drain the fat from the meat, drain the water from the noodles and toss both in the noodle pot. Dump in the tomato soup and spices. Stir well. Top with cheese. Broil for 5 minutes to melt. You could also put it in a casserole dish in the oven at 350 for 30 mins, but if you work fast, all you need is to melt the cheese because everything else is still hot.